We’ve been eating quite a bit of kale around these parts and I’m not complaining. We grew kale all winter in one of our hoop houses and this spring at has really taken off. Sweet, tender and delicious. We’ve been adding kale to our morning smoothies, scrambled eggs and of course plenty of salads. This particular salad highlights the first of the radishes and some tender chicken breasts that we grilled a few evening ago. It comes together in a flash (especially if you grill your chicken in advance) and is tossed in a tangy dijon tahini dressing. Perfect served as a side with a cup of our Spring Greens Soup. I hope you all enjoy this salad as much as we do. Grab a fork! Use and immersion blender or small food processor to whisk together all the ingredients for the dressing. Taste test and adjust seasonings as needed. Set aside. 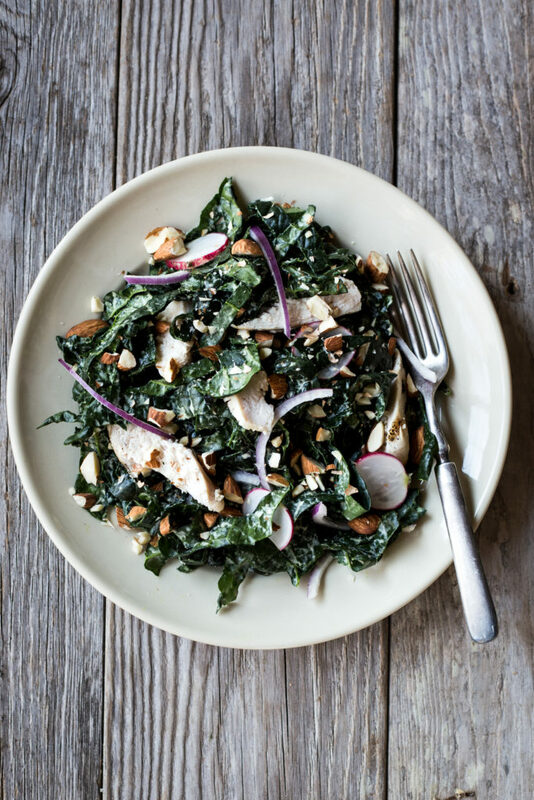 Place the chopped kale in a large bowl, drizzle with 2 Tablespoons of the dressing and use your hands to massage the dressing into the leaves until they become tender and turn bright green. Toss in the remainder of the ingredients and drizzle with more dressing. Serve. That sounds perfect! The tahini dressing seals the deal! This looks amazing! Can’t wait to try it. Thank you for sharing.